Faithful mass: A section of the crowd participating in the Corpus Christi procession through the Brisbane CBD last Sunday. 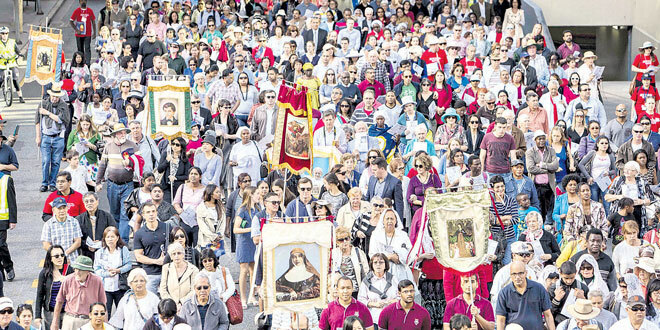 CATHOLICS showed a remarkable public expression of faith in a 400m-long Brisbane-city procession to mark one of the greatest feasts of the Catholic Church last weekend. Up to 2000 Catholics processed through Brisbane city from St Stephen’s Cathedral behind the Blessed Sacrament for the Feast of Corpus Christi. The feast, which this year landed on May 29, celebrates the belief that Jesus Christ’s Real Presence is in the Eucharist. The procession, led by Brisbane Auxiliary Bishop Joseph Oudeman, took nearly one hour to return to the cathedral for Benediction and closing prayers. It is the first time the annual procession has publicly marched through Brisbane city in 40 years. Corpus Christi Brisbane spiritual director and Oratory priest Fr Paul Chandler said there were no “unpleasant reactions” from the public. Fr Chandler said the public display of faith showed Catholics were not afraid to bring their beliefs outside of churches. “During the procession, as we turned a corner, I looked over my shoulder and the crowd was stretching a long way,” he said. Catholics from numerous ethnic groups including the Syro-Malabar Rite, Vietnamese, Filipino, African, Latin Mass and youth groups attended the procession. Fr Chandler said the Church had always recommended a public procession for the feast day. “Many churches hold their processions around the church grounds, but a more stirring quality to our faith is to make a public demonstration of the faith,” he said. Roy Perez, one of the procession’s organisers and a Perpetual Adoration organiser at Villa Maria, Spring Hill, said the public display of faith was an important message ahead of looming political pressure that could restrict expressions of religious beliefs in Australia. Mr Perez said the date of the Eucharistic procession was especially timely. “We have been able to take Our Lord to the streets just a few weeks before the election,” he said. Mr Perez said the organising committee was hoping to grow the event to match Sydney’s Eucharistic procession, which attracts 10,000 people. The annual Corpus Christi procession in Brisbane began in 1912 at St Joseph’s Nudgee College, but numbers exceeding 50,000 forced a move to the Brisbane Exhibition Grounds. The tradition disbanded in Brisbane nearly 40 years ago until deceased Jesuit Father Gregory Jordan revived the devotion 20 years ago. Mr Perez believed Fr Jordan was interceding for organisers in the lead-up to the remarkable day. “We really could feel Fr Jordan’s presence working and helping us right through the preparations,” he said. The Brisbane procession this year joined events worldwide marking what is considered the most important Catholic feast celebrating the belief in Jesus’ Real Presence in the Eucharist. Bishop Oudeman reminded Catholics the feast of Corpus Christi followed the solemnity of the Trinity, signalling God’s desire to unite all of humanity to him eternally. “The Trinity so loved us that the Son became incarnate and was made flesh to draw us into this Communion for all eternity,” he said. Bishop Oudeman said Jesus Christ repeated God’s will for unity when on the night before he died, he prayed: “Father, may they be one as we are one”. The Gospel for the feast day, the multiplication of loaves and fish, indicated God’s plan for the salvation of all humans, he said. “Jesus now offers his body and blood in this new and eternal covenant between God and God’s people,” he said. Bishop Oudeman concluded his homily by calling for greater awareness and reverence for the Eucharist, “this greatest of sacraments”.